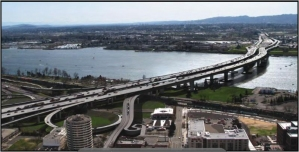 » I-5 bridge toll: How would it work? I-5 bridge toll: How would it work? A rendering of the proposed Columbia River Crossing. Oregon legislators are wondering if and how Oregon could collect the toll on the proposed Columbia River Crossing from Washington state drivers. Never mind Washington. How about Oregon and California drivers? How would the toll be collected from us and our southern neighbors? Or from others from around this continent using Interstate 5 to cross the Columbia River. I’m asking because I don’t know, and in the extensive coverage of this issue in The Oregonian, I have not seen any recent mention of just how the toll would be collected. If the plan called for toll booths, the question would not come up. Every vehicle that does not have a pass would have to stop and pay at the booths. But evidently toll booths would slow traffic too much, so the plan calls for some electronic collection system. Occasional travelers or tourists, though, would not have the requisite transponders on their vehicles. So is it the plan to have booths for some vehicles but not others? Or are we talking some kind of license-plate recognition system that would send bills to the home addresses of registered vehicle owners? The toll would be about $2.50, according to the report from a legislative hearing on Tuesday. This seems relatively low. But even at that rate, there’s an estimate that the toll would cause 40,000 drivers a day to use I-205 and the Glenn Jackson Bridge instead. Forget about getting to the Portland airport on time if this comes about. I assume the Oregon DMV computers will be able to talk to every state’s DMV computers, including Canada and Mexico, to obtain a licensee’s billing address. Sounds like a lot of work to collect a toll. Only a bureaucrat would spend $5.00 to re-coup $2.50. My husband & I used a toll road in Colorado. Several weeks later we received a bill for $2.36. We paid it but it left me feeling a little scornful of that state!